By Kelly Gilblom (Bloomberg) — Royal Dutch Shell Plc made one of its biggest commitments to the North Sea in 30 years, with plans to redevelop the Penguins oil and gas field. The Anglo-Dutch oil major will build a floating production, storage and offloading vessel — its first new manned installation in almost three decades — to take output from eight wells it plans to drill. Peak production will be the equivalent of 45,000 barrels a day, with a break-even price of less than $40 a barrel, Shell said on Monday. “It is another example of how we are unlocking development opportunities, with lower costs, in support of Shell’s transformation into a world class investment case,” Andy Brown, Shell’s upstream director, said in a statement. Penguins, a joint venture between Shell and Exxon Mobil Corp., is already operational after first being developed in 2002. Oil from the field — about 150 miles (240 kilometers) northeast of the Shetland Islands — will be transported by tanker to refineries, while the gas will be sent by a pipeline to the St. Fergus terminal in Scotland. Production in the North Sea has fallen by about two-thirds since its heyday in the 1990s as fields have depleted. The U.K. is making it easier to claim tax relief to encourage companies to apply new technology to extract oil and gas from fields previously considered too expensive and difficult to develop. The U.K. Oil and Gas Authority said the redevelopment is “a vote of confidence” for the area. 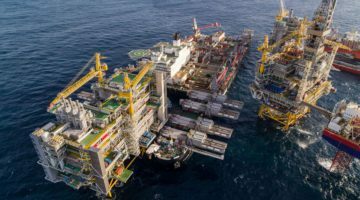 “We are expecting further high-value projects to move forward to sanction this year, which will help prolong U.K. production for many years,” Andy Samuel, OGA chief executive, said in a statement.